The holy place (peetha) of the Goddess Hingula is situated on the bank of the river Simhada in the West of erstwhile Talcher Estate (Now in the District of Angul). In Assam, there is a place of pilgrimage named Jwalamukhi where a similar goddess Hingula or Hingulei or Hingulaksi is being worshipped. It is for this reason that the presiding deity of Talcher in village Gopal Prasad who bears the form of fire is named Goddess Hingula. Such holy places (peethas) of Hingula are also situated even outside India in Karachi and Kabul. 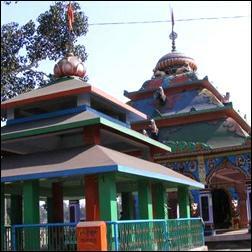 Both Hindus and Muslims worship at this holy place like that of Kaipadar in Khurda. Talcher is 20 Kms away from Angul. There is regular bus service to Talcher from Angul and from major towns of Odisha. Train route is also available to Talcher. Give Responses for "Goddess Hingula of Angul"